The Common Tiger is another Danainae that can be found at Gardens by the Bay. This male form-genutia Common Tiger was shot by ButterflyCircle member Sunny Chir. 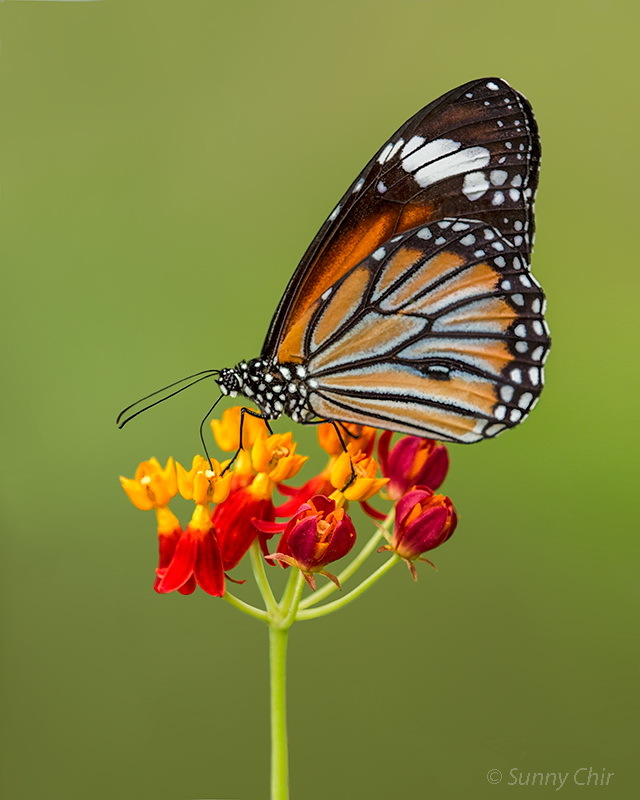 The butterfly, feeding on the colourful flowers of the milkweed Blood Flower (Asclepias curassavica), makes an eye-catching shot against a green background. Like its close cousin, the Plain Tiger and also belonging to the same genus Danaus, the Common Tiger is relatively widespread in Singapore, occuring from urban parks and gardens, to coastal areas where its caterpillar host plant, the lactiferous vine, Cynanchum sp. grows.